It may not yet be over, but twinkling on the horizon stands the spectre of a post-Muammar Gaddafi Libya. The blood-and- guts bombardment by NATO warplanes of Bab Al-Azizia, the Gaddafi nerve centre in the heart of the Libyan capital Tripoli, is beginning to add up to something sinister and has taken its toll on the morale of the pro-Gaddafi forces. Yet instead of solutions to the problematic of a post-Gaddafi Libya, the country appears destined to be treated to yet another agonising instalment of Gaddafi versus the militant Islamists. That is a huge shame for Libya. Gaddafi has not yet buckled in, but should be applauded for holding on tenaciously to his principles. Predictably, upheaval is not likely to reverberate in other Arab and African counties. The possibility of Libya's Salafis generating unpleasant religious radicalism does not appeal to the Western powers, least of all to the United States. "The truth is, I think frankly, one of the reasons that we have been as cautious as we have in terms of providing other than humanitarian support and some non-lethal assistance to the opposition is because of what we don't know," US Secretary of Defense Robert Gates was reported as saying. The Libyan people are left in a stew of lethal lawlessness by the military support provided by Western powers and the financial backing furnished lavishly by the oil-rich Gulf Arab states on anti-Gaddafi forces, mortally weakening the Libyan state. Without substantial change in Western perceptions of the political situation in Libya, all this mess will get worse. The worst of the Libyan crisis is already upon its hapless people. There are certain signs, albeit barely perceptible, that Gaddafi and his henchmen are waking up to the ramifications of these problems. The flurry of diplomatic activity in which the African Union, and in particular South Africa's President Jacob Zuma, and Greek and Turkish mediators have been in close consultation with officials of the regime. "Libya will not kowtow to the unjust embargo," Libya's Foreign Minister Abdel-Aati Al-Obeidi told the United Nations secretary-general's chief envoy to Libya Abdel-Illah Al-Khatib in Tripoli this week. Gaddafi's foreign minister stressed the savage bombardment of innocent civilians. Al-Obeidi condemned the massacre of scores of Muslim clerics during a prayer council in a mosque in the Libyan government held oil terminal of Brega. He also decried the targeting of Gaddafi and his family that resulted in the assassination of the Libyan leader's son Seif Al-Arab, which only strengthened the resolve of the Libyan people to defend the sovereignty of the country. The crunch of the matter, Al-Obeidi told Al-Khatib, was that after three months of fierce fighting and violence, and in spite of the aggressive intervention of Western powers in a desperate bid to prop up the anti-Gaddafi forces, the Libyan leader remains firmly in power and refuses to step down. Russia and China, permanent members of the UN Security Council, have expressed outrage at the turn of events, pointing out that the UN mandate was to protect Libyan civilians and not to slaughter innocent civilians who happened to support Gaddafi for one reason or another. UN Secretary-General Ban Ki-Moon spoke by telephone with Libyan Prime Minister Al-Baghdadi Al-Mahmoudi last Wednesday and the two sides concurred that the Libyan protagonists should negotiate a ceasefire immediately. Both the UN secretary-general and his chief envoy to Libya expressed a willingness to "better understand the situation in Libya". It has become a truism, buttressed by the hard realities on the ground, that Libya's political future will belong to one or the other factions that comprise the National Transitional Council (NTC) headquartered in Benghazi. The irony is that even though NATO air-strikes stopped Gaddafi's troops in their tracks, and redeemed Benghazi, Libya's second largest city and the bastion of the Libyan anti-Gaddafi uprising, saving it from falling into Gaddafi's hands, it has not enabled the NTC forces to threaten Tripoli. The Libyan capital is firmly in the grip of Gaddafi, even though the NTC and allied insurgents will do everything to break the will of the Libyan leader. If the NTC is already looking to a post-Gaddafi future in alliance with the West, then such a perspective underscores the urgent need to examine scrupulously the political intentions and ideological orientation of the disparate political groups that comprise the NTC. These proxies threaten not just Libya's immediate neighbours -- Egypt and Tunisia -- as they struggle to nurture their nascent democracies, but they threaten the stability of the entire Saharan and Sahelian regions of Africa as well. It has become increasingly apparent that the West, and in particular Washington, is subjecting the debilitating Libyan civil war to forensic reappraisal. With tens of thousands of Libyan lives lost, and a military stalemate with no end in sight, it has become clear that either the West is reluctant to get rid of Gaddafi, or that it is unwilling to do so. True NATO has razed the Libyan Security Services building, according to Gaddafi sources, but Gaddafi clings to power. Three months on from the outbreak of Libya's anti- Gaddafi uprising, smoke billows in Tripoli. The West aims at prising Gaddafi from power, but it doesn't look like he is going anywhere. NATO doesn't speak with one voice. And, Libya is virtually partitioned. The question is whether it is Gaddafi's stealth or NATO indecision and weakness that are spawning the current political and military impasse. Since 17 February, there have been 2,700 NATO air raids on Gaddafi strongholds, even though the Libyan leader insists that civilians have borne the brunt of the NATO blitz. The implications are still being played out. Gaddafi claims that NATO's most recent air strike was aimed at destroying the Anti-Corruption Agency which had carefully compiled financial and political corruption files on the NTC. "The files have survived intact. But how is this raid helping the protection of civilians? The real motive for the attack is to conceal the truth, the tangible evidence, about the corrupt NTC leadership, from the world," Libyan government spokesman Ibrahim Moussa told reporters in Tripoli. The noose is tightening around Gaddafi. There are reports that the Petroleum Minister Shoukri Ghanim and former Libyan Arab League representative Abdel-Moneim Al-Houni and Ali Tarhouni have also defected. They follow former interior minister Abdel-Fattah Younis, foreign minister Moussa Koussa and justice minister Mostafa Abdel-Jalil. International Criminal Court Chief Prosecutor Luiz Moreno-Ocampo is now officially seeking an arrest warrant for Gaddafi, his son Seif Al-Islam and Gaddafi's right hand man and son-in-law Abdullah Al-Senousi, Libya's national security chief, for their ostensible crimes committed against humanity and in particular against the Libyan people. Moreno-Ocampo, of course, did not look into crimes committed by the NTC, let alone NATO forces. The minimum requirements for any credible inquiry are that it must scrutinise all allegations, including Libyan government claims that NATO has butchered innocent civilians with their air sorties. The focus should not be exclusively the drip-drip of dubious allegations of crimes against humanity by Moreno-Ocampo. There is short time left for Gaddafi, a finite window, maybe not to reverse entirely the threatening menace posed by NATO and its proxies in Libya, but to halt the country's slide towards an abyss. Can it be done? In the Catholic Church’s heyday in Benghazi during the Italian occupation, a cavernous double-domed cathedral was built that still dominates the city’s waterfront. The cathedral, now with Islamic crescent moons adorning the domes, has stood empty since thousands of Italians were expelled from Libya when Gaddafi took power. Locals say the site was later used as a venue to hang his opponents. Sylvester Magro, the Maltese Catholic bishop of Benghazi, told Reuters he usually has some 10,000 Catholics in east Libya under his care, but was now tending to a reduced flock of a few hundred. For Mass, he has moved to a Benghazi hospital church, a smaller venue than usual. Speaking carefully, he would not be drawn on hopes and fears for his congregation’s future. Magro’s usual venue for Mass, a far larger building erected in 1872, was confiscated by Gaddafi in 1969 and returned to the Church in 1976, he said. “For the moment, it is the conflict that worries us. It’s a bad situation, tension. The future is unclear. The present time is taken up in prayer for the end of the conflict,” he said. The Christian Church in eastern Libya, which traces its roots back two millennia to the era of Christ, is fighting for survival because war has forced nearly all its worshippers to flee. But Muslims in Libya’s rebel-held east are keen to show that Christians are still welcome, drawing a contrast with the Christian community’s turbulent history under Muammar Gaddafi, whose rule in the east was ended by mass protests in February. At the Coptic Church in Libya’s second city of Benghazi, the main rebel stronghold, bearded and robed Father Polla Eshak swings an incense burner among mostly empty pews for the worshippers who have not fled the fighting. Many Christians in Libya are Copts, an Egyptian sect, and the number going to Eshak’s church has shrunk to about 40 from over 1,000 before the revolt began. Eshak says it is fear of war, not persecution, that caused the exodus of Christians, nearly all of whom are foreign farmers, builders, nurses and other workers vital to Libya’s economy. “Gaddafi’s administration gave us freedom and the next one will too, judging by the way we’ve been treated here,” Eshak said, referring to east Libya’s new rebel leadership. The rebels have pledged to enshrine freedom of religion in the Constitution so it no longer depends upon the whims of political leaders. “The revolutionaries are good to us. They are afraid for us more than their own people. There’s a lot of affection between us and Libyans,” said Redha Thabit, a Copt in Benghazi. Evidence of Libyan Christian communities has been traced back to the century following Jesus’ birth. According to three of the gospels, it was Simon of Cyrene – an ancient coastal city lying in the east of today’s Libya – who helped to carry the cross upon which Jesus was crucified. Christianity became mostly a religion of foreigners when Islam swept through in the seventh and eighth centuries, kept alive by trader communities, many from Pisa, Genoa and Malta. The 1969 army putsch against King Idris that brought Gaddafi to power led to the confiscation and closure of churches and tight monitoring of religious practice. But the Libyan leader’s attitude to Christians gradually mellowed and Christians in Benghazi said they faced few challenges in recent years. In Eshak’s office, a photo of Gaddafi with Coptic leader Pope Shenouda hangs on the wall. Gaddafi gave Shenouda a human rights award in 2003 and gave Copts four buildings to use as churches for free, Eshak said. Eshak’s church still sports carvings of the star of David, reminders of the building’s former role as a synagogue for Libya’s Jewish community, before Jews were attacked and exiled in the years following Israel’s creation. Muslims living near the building now keep an eye on their Christian neighbours to ensure history is not repeated. “In this street, no one can say anything against them. If they do, we’ll all come to their defence,” said Haji Salim, a Muslim who lives opposite the church. Najib Makhlouf, another local keeping an eye on the church, lamented the fate of the area’s Jewish inhabitants and said any sectarian violence today would undermine the rebel cause. Clashes between Christians and Muslims in neighbouring Egypt have become more common in Egypt since President Hosni Mubarak’s overthrow in February after 30 years in power. 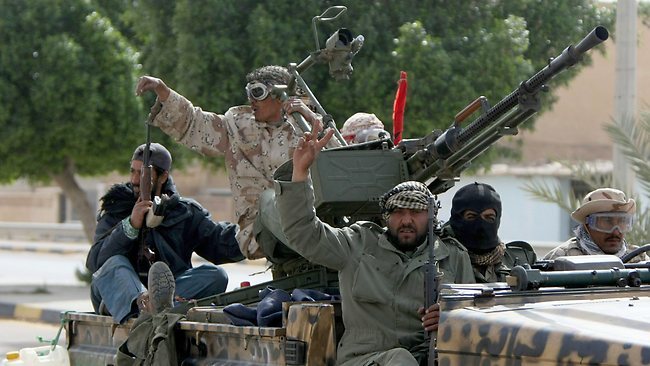 There are also fears that al-Qaeda could infiltrate Libya. Al-Qaeda-linked groups conducted several high-profile attacks on Iraq’s Christian minority after the 2003 Iraq war. “The most dangerous thing is sectarian attacks. In Egypt, they were started by a fifth column to sabotage the revolution,” Makhlouf said. CAIRO – Islamic hard-liners, some of them heavily suppressed under three decades of Hosni Mubarak's regime, are enthusiastically diving into Egypt's new freedoms, forming political parties to enter upcoming elections and raising alarm that they will try to lead the country into fundamentalist rule. Some militants, taking advantage of a security vacuum, aren't waiting for the political process. They have attacked Christians and liquor stores, trying to impose their austere version of Islamic law in provincial towns. The Islamists' newfound energy prompted the ruling military to warn on Monday that Egypt "will not be turned into Gaza or Iran." Islamists could fare well in parliamentary elections scheduled for September, especially if the various groups run on a unified ticket. Their chances are boosted by the disarray among other groups. Traditional opposition parties were deeply restricted under Mubarak's 29-year rule and have no popular base to speak of. The liberal youth groups behind the 18-day uprising that forced Mubarak to step down on Feb. 11 are still scrambling to organize before voting day. The Islamists, furthermore, are well funded and organized. The most established fundamentalist group, the Muslim Brotherhood, has years of experience in contesting elections. Liberals and leftists, including the youth activists who led the protest uprising against Mubarak, are caught between their stance that all sides must be allowed to enter the political game if Egypt is to be a real democracy and worries whether Islamists will play by the rules. "I think there is too much Islamophobia," Khaled Abdel-Hameed, one youth leader, said of fears of Islamists hijacking the process. "Everyone is trying to hijack the revolution, including me. If people elect religious groups, I will respect their choice." Another activist, Mustafa al-Nagar, is more concerned. "I am worried most about the Salafis because they are not accustomed to politics," said al-Nagar, who campaigns for Mohamed ElBaradei, a Nobel Peace laureate and potential candidate in presidential elections due in November. "Their main concern is to exclude anyone else." While the Brotherhood has long been Egypt's best organized opposition movement, the Salafis are a new player in politics. Salafis are ultraconservatives, close to Saudi Arabia's Wahhabi interpretation of Islam and more radical than the Brotherhood. They seek to emulate the austerity of Islam's early days and oppose a wide range of practices they view as "un-Islamic" — rejecting the treatment of non-Muslims as citizens with equal rights as well as all forms of Western cultural influence. Salafis traditionally stayed out of politics, rejecting democracy because it replaces rule by God's law with the law of man. The movement grew in recent years because it was tolerated and even encouraged by the Mubarak regime to counter the Muslim Brotherhood. With Mubarak gone, the Salafis have abandoned their disdain for politics. Yasser Moutwaly, a Salafi leader in the Mediterranean city of Alexandria, told The Associated Press that the movement planned to set up its own party, though he insisted that entering politics would not mean abandoning its principles. He said the Salafis and the Muslim Brotherhood were engaged in preliminary contacts over the possibility of "coordination" in the parliamentary elections. Another contender is the Gamaa Islamiya, or the "Islamic Group," a militant organization that fought the Mubarak regime in a bloody insurgency in the 1990s, seeking to establish an Islamic state in Egypt. It has a base of support in southern Egypt, particularly in the city of Assiut, and is conducting internal elections to create provincial and consultative councils nationwide. Ominously, the group forced two of its veteran leaders — Karam Zohdi and Nageh Ibrahim — to resign amid criticism that they sold out to authorities when they agreed to abandon violence to win their release after serving long jail terms. Islamists are already showing their confidence. In Assiut, which has a sizable Christian minority, Islamists wrested control of mosques from government preachers, installing their own imams and prayer leaders. The city is filled with signs exhorting residents to follow Islamic teachings and women to wear the hijab, or headscarf. "The hijab is obligatory," one sign says. "Take your eyes off women," another chides men. A recent rumor that Salafis planned to attack female Muslim students at Assiut University who don't wear the headscarf, prompted some women to stay away from the 75,000-student campus for a day. Salafis, who reject the veneration of religious shrines and tombs as a sign of idolatry, are believed to be behind the destruction of at least five Muslim shrines in the Nile Delta region the past week. They are also blamed for attacks on Christians and others they don't approve of. In one attack, a Christian man had an ear cut off for renting an apartment to a Muslim woman thought to be involved in prostitution; in another a Muslim was killed for allegedly practicing magic, which ultra-conservatives denounce, a security official said. In the oasis province of Fayoum southwest of Cairo, Salafis have forced the closure of four cafes that serve alcohol. They also set fire to four Christian homes in a Fayoum village, prompting clashes with residents, said the official, who spoke on condition of anonymity because he was not authorized to share the information with the media. Salafis have also threatened to destroy some of the most revered shrines in Cairo, dedicated to members of Prophet Muhammad's immediate family and beloved by many more Muslims. A Salafi spokesman, Abdel-Monaim al-Shahat, insisted that the attacks on shrines were isolated acts. "We don't approve of having shrines in mosques, but we also reject their destruction," he said. But Egypt's top mainstream cleric, the grand sheik of Cairo's Al-Azhar, Sunni Islam's foremost seat of learning, warned the shrine threats could lead to violence between Muslims. "Blood will be knee-deep," Ahmed al-Tayeb said. He called on al-Azhar scholars, seen as the defenders of moderation, to take on the "extremists" in ideological debates. Maj. Gen. Mukhtar al-Mallah, a member of the military's Supreme Council which has ruled Egypt since Mubarak's ouster, told newspaper editors in an interview Monday that the army "will not allow extremist groups to take over Egypt." He expressed his concern about the actions of the Salafis, but also said no groups can be excluded from the political scene, "whether they are Wahhabis, Salafis, Muslim Brotherhood or Christians. Because of the Mubarak regime's heavy restrictions on the opposition and widespread fraud at past elections, it has been long been impossible to judge Islamists' true popular support. The Muslim Brotherhood, which was banned under Mubarak but ran candidates as independents, made its best showing in 2005, when it won a fifth of the legislature's seats. Now, the Brotherhood is in the process of creating its own party, a satellite television station and a daily newspaper to promote its message. Its leaders estimate they would win around 30 percent of the legislature's seats. They say they will not field a presidential candidate. A referendum last month provided an early exercise for Islamists at the polls. The Brotherhood and Salafis pushed hard for a "yes" vote on a raft of constitutional amendments, some of them claiming that it would be a "yes" for Islam. Many liberal protest leaders opposed the amendments, saying they wanted greater changes. The amendments passed handily, by 70 percent. But the results give hints of a realistic measure of the Islamists' weight. Out of 45 million eligible voters, 14 million voted "yes." But the majority of those approved the changes because they saw the limited amendments as bolstering stability, not because they support the Brotherhood or the Salafists. That, some analysts argue, suggests that the religious groups' core support ranks in the several millions and that the bulk of the electorate is not in their camp or up for grabs. Key Articles on Libya conflict from around the world. AS the military and humanitarian quagmire in Libya deepens, a clarion call has gone out to followers of the global jihadist movement in the West. "Who wants to join the mujahidin? The gates of jihad are open in Libya!" declares a message posted on a pro al-Qa'ida internet forum monitored by Western analysts. The message - and countless others like it - has set off alarms in counter-terrorism circles in the West, as al-Qa'ida and its allies move to exploit the foment in the Arab world, seizing on the conflict in Libya as a new cause celebre for Islamic militants. And as yesterday's WikiLeaks release shows, al-Qa'ida suspects freed from Guantanamo Bay are at work in Libya. A report from the International Centre for the Study of Radicalisation says internet jihadists are portraying Libya as the newest front in the global jihad against the West, in a policy dictated by al-Qa'ida's top leaders. "Senior leadership figures, including Ayman al-Zawahiri, have given a number of sermons concentrating almost solely on Libya and portraying it as the most fertile ground for their global movement," says the report's author, Alexander Meleagrou-Hitchens, a research fellow at ICSR. He says Zawahiri's call has been echoed on English-language jihadist forums. "The Western Salafi-jihadi movement is attempting to take ownership of the rebellion on behalf of the global jihad, and is portraying anti-Gaddafi forces as mujahidin, while also encouraging Western Muslims to do all they can to reach the country and take part in a supposed jihad." The ICSR has monitored a stream of communications on al-Qa'ida run and backed websites and forums since the Arab spring began. A typical post says: "My brothers and sisters, we are facing a global change, Alhamdulillah [praise God]! We will see this uprising continuing in all Muslim countries and soon we will see the banner of Allah everywhere!" The forums are full of news of the exploits of jihadist fighters who have joined "Islamic battalions" in Libya under names such as the Thunderbolt Battalion and the Islamic Army of Benghazi, and so-called exclusive pictures of fighters purporting to be mujahidin on the front lines, accompanied by messages urging new recruits to join them. They provide directions on how best to travel to Libya, along with this incentive: "The market of paradise has opened and the hoor al ayn [virgins promised to martyrs] are waiting." The forums are used to disseminate stories such as one that recounted how a band of mujahidin overran a Libyan army base in al-Bayda in the northeast of the country. Western analysts believe the claims are exaggerated and some are simply echoes of Gaddafi regime propaganda aimed at discrediting the rebellion by portraying it as an Islamist uprising. However, among al-Qa'ida's online followers it seems they are having the desired effect. Another post says: "The only thing we can do at this moment is pray for the brothers and await the official declaration of an Islamic emirate in Libya." The ICSR's assessment is that it is essentially a propaganda push by al-Qa'ida and its allies to promote Libya as a "new Afghanistan", that is a new rallying point to revitalise their movement. Al-Qa'ida has been cultivating its contacts in Libya for decades. Its key ally there is the old Libyan Islamic Fighting Group which was formed in 1995 to overthrow President Muammar Gaddafi and contribute to the international jihadist campaign. Despite Gaddafi's long-term support for international terrorism, he is regarded by Islamic militants as an apostate ruler who has betrayed his promise to make Libya an Islamic republic. US terrorism analyst Bill Roggio from the Long War Journal says north and eastern Africa have proven fertile ground for al-Qa'ida with their restive Muslim populations, oppressive governments and lawless regions that make ideal sites for terrorist training camps. The Libyan Islamic Fighting Group was set up by Libyans who had fought against the Soviet army in Afghanistan in the 1980s, several of whom went on to take up key positions in the al-Qa'ida command structure. Many of the group's founding members trained in al-Qa'ida camps in Afghanistan, according to a report by the US Council on Foreign Relations. Al-Qa'ida's leader in Afghanistan until his death in 2008, Abu Laith al-Libi, was a Libyan, as is the senior field commander regarded by some US intelligence analysts as Osama bin Laden's heir apparent, Abu Yahya al-Libi. Yesterday' s WikiLeaks documents show that at least one former detainee who was set free, Abu Sufian Ibrahim Ahmed Hamuda bin Qumu, is training with rebel forces in Libya and has close ties to al-Qa'ida. In 2006 the LIFG merged with militant groups from neighbouring Algeria, Tunisia and Morocco to form a new al-Qa'ida franchise, which called itself al-Qa'ida in the Islamic Mahgreb. The merger was heralded by Abu Laith al-Libi, who said: "We announce we are joining al-Qa'ida's loyal soldiers. The tyrant of Libya is pushing the country into a new quagmire. He suddenly discovered that America, the guardian of the cross, is not an enemy." The merger and AQIM's vow to topple Gaddafi were apparently prompted by the dictator's rapprochement with the US in 2003, when Gaddafi announced that Libya would end its biological, chemical and nuclear weapons program, which had long been used to support international terrorism, and the US dropped sanctions and restored diplomatic relations in return. The Libyans were officially welcomed into the fold by al-Qa'ida deputy head Zawahiri, who condemned Gaddafi for surrendering his "weapons and equipment to Crusader masters", and called for the overthrow of the governments of Libya, Tunisia, Algeria and Morocco. AQIM's leader Abdelmalek Droukdal told The New York Times in a 2008 interview: "Our general goals are the same goals of al-Qa'ida the mother." AQIM has been most active in Algeria where its forerunner, the Salafist Group for Preaching and Combat, led a bloody insurrection that began in 1992 after the military regime cancelled parliamentary elections when it seemed a coalition of Islamic parties was on the verge of winning. Since the name change, AQIM has carried out guerilla-style ambushes against military personnel and truck bombs against government targets, kidnapped tourists for ransom, bombed buses and embraced suicide attacks. Experts believe these actions suggest widening ambitions within the group's leadership, which is now pursuing a more global, sophisticated and better-financed direction, says a recent report by the US Council on Foreign Relations. It notes that AQIM used the Iraq War and other unpopular Western policies to recruit new members. A worldwide caution issued by the US State Department in January says AQIM has declared its intention to attack Western targets and has claimed responsibility for the kidnappings and murder of several Westerners. Among the posts detected recently on the jihadist forums is one from a regular participant who claims to have contacts with al-Qa'ida, asserting that AQIM is "preparing to begin operations in Libya". The commentator claims that between 4000 and 7000 Islamic militants have assembled in the city of Benghazi. "The Salafi brothers in Benghazi have declared the Islamic emirate of Libya. The brothers have captured military tanks, Hummers, heavy-medium-light machine guns," the commentator reports. Jihadist ideologues whose posts have been monitored praise the purity of the uprising in Libya compared with other manifestations of the Arab spring, such as in Egypt, which they deride for being secular and pro-democracy. [God is great], and nobody shouts the name of a secular-democratic party". There is intense debate on the forums over the provision of Western military assistance to the Libyan rebel movement, which has prompted consternation about an alliance with the so-called enemies of Islam. A participant on one forum commented: "I really need some clarification on the current situation in Libya. We see images from kufr [non-Muslim] news sources that the Libyans are requesting help from the kufr against Gaddafi. Could someone please confirm that the mujahidin in Libya are on the straight path." Forum leaders have reassured participants on this score, essentially arguing the end - achieving an Islamic state - will justify the means. They liken the situation in Libya to that in Afghanistan in the 1990s, when a range of alliances was forged between rival factions in order to oust the Soviet army, before the Taliban eventually took power. "[In Afghanistan] we had Sunnis, nationalists, Ikhwanis [Muslim Brotherhood], Sufi, Shi'ites and other groups fighting shoulder to shoulder against the Russians. "What happened after the war? We witnessed a civil war between the groups. The Taliban succeeded in taking 90 per cent of Afghanistan. They declared the Islamic emirate and implemented the Sharia. I think that the same thing will happen in Libya." The mainstream Libyan rebel movement has been eager to distance itself from the Islamists who are trying to muscle in on their rebellion. On March 30, the Libyan Interim Transitional National Council issued a statement intended to allay Western fears about an Islamist takeover, stressing its "commitment to the implementation of the relevant Security Council resolutions on counter-terrorism [and] sanctions concerning al-Qa'ida and the Taliban". The ICSR believes the jihadists' propaganda is more wishful thinking than reality. "Their claims are unconvincing and there are notable discrepancies between their interpretation of events and the facts on the ground," Meleagrou-Hitchens reports. He says despite the rallying cries, there is little concrete evidence of a strong al-Qa'ida presence or serious Islamist activity among the rebels, and their Transitional National Council is "clearly not an al-Qa'ida aligned movement". However, Western analysts are keeping a close eye on the evolution of the Libyan rebellion, noting that senior online militants are urging a cautious, patient, long-term approach rather than a quick revolution. The conventional wisdom on the Islamist forums, according to ICSR, is that "there is enough of a Salafi-jihadi presence to ensure that once Gaddafi is overthrown, Libya will begin to move toward transforming into an Islamic state governed by Sharia". One forum leader warns that declaring an Islamic emirate in Libya would prompt a Western invasion, and stresses instead that they should build up their military forces, "educate the people" on the need for an Islamic state, "and then declare the emirate, with weapons, economy and a people ready to fight for Allah."